This luxurious all-inclusive family-friendly resort set in Playa Bavaro offers 512 luxurious rooms with stunning views and deluxe amenities. Relax at the Bahia Spa or take a dip in the pool. Enjoy an array of water sports including snorkeling, kayaking and paddle surfing. 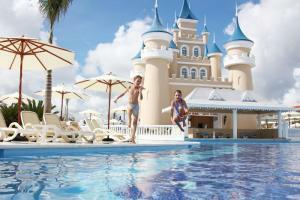 An extensive kids program and a children's water park offer endless thrills. After a day under the sun, dance the night away to the rhythms of Caribbean. Located in the Dominican Republic, Punta Cana, just steps away from the beach.